We know that the vast majority [of the department] serve our city with pride, with courage, with honor and with distinction. But to those of you who wish to engage in brutality, misconduct, racism and corruption, let me be clear: There is no place in the Baltimore City Police Department for you. Today’s indictments are the next step to the legal process that is running its course. … I’ll continue to be relentless in changing the culture of the Police Department to ensure that everyone in our city is treated equally under the law. There will be justice for Mr. Gray, for his family and for the people of Baltimore. On Friday, State’s Attorney for Baltimore City Marilyn Mosby declared that officers “illegally arrested” Freddie Gray on Friday during a press conference in which she announced that there is probable cause to file criminal charges against all six officers involved in the incident. “I assured his family that no one is above the law and that I would pursue justice on their behalf,” Mosby said at the presser in downtown Baltimore. A medical examiner ruled Gray’s death a homicide. Mosby emphasized that Gray had requested medical attention in the van and began to struggle and was held “against his will.” She said that officers did not establish probable cause for his arrest. 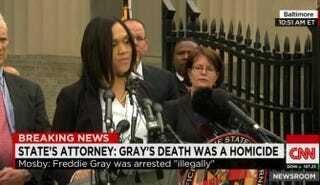 The knife that was found on Gray after he was searched by officers was “lawful under Maryland law,” she said. Charges against the officers include second-degree murder, involuntary manslaughter, assault and misconduct in office. Warrants have been issued for the officers’ arrest, Mosby said. “The findings of our comprehensive, thorough and independent investigation, coupled with the medical examiner’s determination that Mr. Gray’s death was a homicide, which we received today, has led us to believe that we have probable cause to file criminal charges," the state’s attorney announced as a few scattered cheers erupted from observers. The van driver, Officer Caesar R. Goodson Jr., was the only officer charged with second-degree murder. His other charges include manslaughter, assault and misconduct in office. Lt. Brian W. Rice was charged with manslaughter, assault, misconduct in office and false imprisonment. Officer William G. Porter and Sgt. Alicia D. White were charged with manslaughter, assault and misconduct in office, while officers Edward M. Nero and Garrett E. Miller were charged with assault, misconduct in office and false imprisonment. The state’s attorney also called on Baltimore residents to remain peaceful as she prosecutes the case so that justice can be meted out. “I heard your call for no justice, no peace. Your peace is sincerely needed as I work to deliver justice on behalf of this young man,” Mosby said, addressing demonstrators. “To those who are angry, hurt or have their own experiences of injustice at the hands of police officers, I urge you to channel the energy peacefully as we prosecute this case. “To the youth of this city, I will seek justice on your behalf. This is our moment. This is your moment. Let’s ensure that we have peaceful and productive rallies that will develop structural and systemic changes for generations to come. You’re at the forefront of this cause, and as young people our time is now,” she added.